Back before I became a mom, when I was just pregnant, I had all these crazy questions that I needed answers to. I wondered how bad childbirth would hurt (it’s true you really do forget about the pain). I wondered how I would ever lose the baby weight (breastfeeding was not my miracle weight loss tool as some had promised.) And finally I wondered if I needed a HUGE diaper bag because I was using cloth diapers. 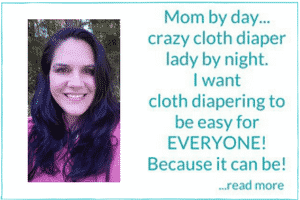 I still remember when I asked on a cloth diaper blog’s Facebook page (sadly it was before I discovered All About Cloth Diapers). Thankfully, the readers kindly pointed me in the direction I needed to go. I honestly thought that I needed an XL bag to accommodate these fluffy diapers. Now, of course, you certainly can still use an XL diaper bag if you are an over packer like me. I just want you to know that you don’t NEED to. The trick to keeping it all manageable is going out with your thinnest diapering options and travel sizes of all other necessities. As for the diapers…I really think your trimmest options are going to be Ai2’s. All in two’s are designed to be used more than one time. 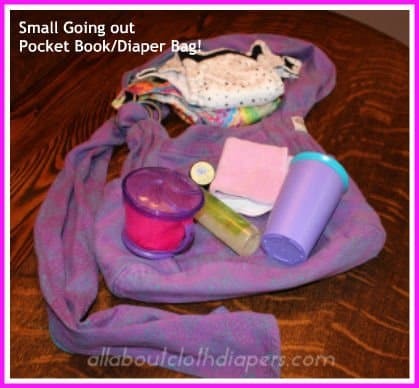 You can bring one or two shells and then a bunch of inserts and have more diaper changes ready to go in less space. Just alternate back and forth between available shells. If it’s a tiny bit wet I usually just leave open on the top of bag or I have been known to lay it out on the floor of my trunk so it’s dry for the next change. I have two bags depending on where and what I am going to be doing. One is my XL over packer’s anonymous bag. I think it has exactly what it needs inside and is pretty organized. This is my going out for the day bag and there are a couple of things I really like about it. I can easily wipe off the outside if some unknown goop gets on it and I can wash it in the washing machine when it needs a deep cleaning. It has pockets on the inside and outside to keep everything separated and easy to find. I can throw in my wallet, keys and cell phone in the outside pocket and not bring my pocketbook. The inside pockets hold my cloth wipes, spray, sunblock, water and cuppy. A change of clothes fits nicely at the bottom of the bag buried there until we need them. I like to use reusable bags as much as possible. I have an awesome Monkeyfoot Designs small wetbag to hold all our on-the-go food options. It fits a little spoon and fork as well as a bib and snacks. If it gets gross, I just toss it in the wash and you are good as new. My small on the go running around the park or quick trip into the store bag is a cute little number I bought used in a Facebook group. Remember, buying used is a great way to save money! It’s a Sandy Toes & Salty Kisses wrap scrap Big Kahuna Bag. Kind of a misnomer as it’s really not that big. It’s got a great adjustable shoulder strap, two bottle pockets and two zipper closed pockets. It is just big enough for a Sippy cup, snack cup and one small wet bag, a few cloth wipes and a clean diaper. Oh and my personal stuff too! Don’t get me wrong I have been known to stuff my diaper bag to its limits. But I have learned that I don’t always need to! I know there are lots of moms that go around with next to nothing and manage just fine. I haven’t figured out that magic trick yet, but as soon as I do, I will fill you all in! What is your favorite diaper bag and why do you love it so? I’m still pregnant but planning on doing cloth diapering so I’ve already started building up our stash (a blend of prefolds with covers, AIO’s, and Pockets mostly). I just got my Skip Hop Studio diaper bag and initially love it but was wondering how in the world I would make cloth diapering on the go work and still be able to fit everything in there, especially when our little one is still a newborn and needing more frequent diaper changes. I love the idea of using AI2’s or Diaper Covers with Inserts on the go! That’s so brilliant. Honestly I’ve been kind of staying away from those two options simply because it seems like they would leak, but it’s definitely something I’m going to at least try. 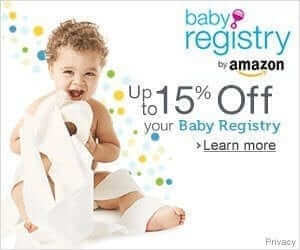 It would make taking more diaper changes on the go so much easier and more compact. Thanks for the great tips, this really helped me! I really don’t think the bag itself matters – it’s all about packing items that are the most versatile! 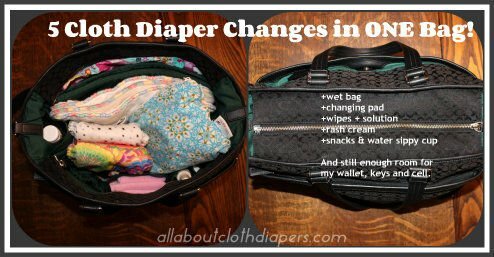 I actually made an infographic on that topic because so many cloth diapering moms seem to think they need some special Mary-Poppins style bag to fit everything. Today I have a 2yr old and a 6 month old. I pack EVERYTHING I need for a full day and sometimes more in that bag with no problem! I have cloth diapers and wipes (always more than I need), wet/dry bag, at least 2 changes of clothes for both children, changing pad, snacks/meal/spoon, toys, books, sippy, bum cream, extra NUKS, nursing cover, burp rag and I have my son’s porta-potty hanging inside another wet bag which hangs from the shoulder strap of my ‘diaper bag’. No, its not a giant bag…its the size of all the other mama’s bags but it might be able to expand width wise because of being made of canvas…? and not having a bunch of inside pockets etc. No frills, no whistles, but it works perfect for me! Thanks Jen, glad you found it interesting! I appreciate it. When I went for a weekend trip (left friday early through Monday late)…. I used a storage tote. That was my back up diaper bag so to speak. A reusuable shopping bag worked great for at the event, clothes and diapers for the day on the bottom, and wipes, and use zip lock bags to put dry food and snacks in as well as spoons so they don’t get everything icky if they get smooshed or opened. I also had a small shoulder carry cooler with sandwiches and cold stuff in it to eat while there. In the tote, I had everything I needed for the next few days, when the event was over for the night, I got into the tote just like a suitcase. I restocked my lunch and snacks (in a tote the snacks dont get smashed like a suitcase) , put all the used diapers in a large wet bag in the tote and put fresh ones in my bag. Basically used the tote as my home away from home to live out of for both of us. clothes all stayed nice neat and folded, diapers clean and fresh and stinky ones contained, snacks neatly packed. Thanks for sharing that Velina! I have a bag similar to the one pictured, I can get quite a bit in there. For most trips, however, I just use it as a backup bag. We typically carry a standard backpack with clothes on the bottom and cloth diapers/wipes on top (4-5 sets fits well). I have a trip coming up that is 4 all day events – still trying to figure out how to pack everything we need for that (with no access back to our car and we need lunches for us and diapers/clothes for little one all day). I’m definitely going to have to figure out the less is more idea. Hi Carrie, I’m sure you will figure it all out and have an amazing time! Did you see Velina’s post. She has some great suggestions! I giggled when I read this post simply because I always thought you really needed to bring everything pluse the “kitchen sink” and I packed my diaper bag that way (sometimes two!). But now I’ve aged or matured, however you want to look at it, I’m a grandma and now it’s one dipe and a small package of wipes that fit nicely in my purse or glove compartment. Of course I can get by with this because my munchkins are not with me away from home that often, but this mindset of “less is best” is still the norm these days. Thanks so much Cindi! I appreciate the kind words. I still tend to be an over packer, but I think I have cleaned up my act a little bit. My mother still lugs around everything and the kitchen sink so I guess I learned from her.lol One thing about that is she ALWAYS has exactly what you need in her bag no matter what you are looking for.